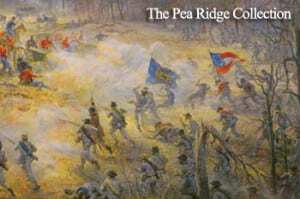 A 28-page full color booklet featuring copies of the 11 original paintings by Andy Thomas featuring scenes from the Battle of Pea Ridge and brief historical summary of each scene. Your contribution will help the Foundation in its goal of raising $250,000 to purchase these magnificent paintings and the building of a gallery so that they will remain at the Pea Ridge National Military Park. Please click the “Buy Now” Button to purchase a booklet for $25.00 online with any major credit card. At dusk on March 7, 3,000 men of the Missouri State Guard charged across Samuel Ruddick’s cornfield hoping to break the union line along the south edge of the field. 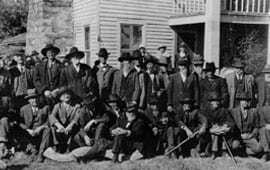 Although the Federals had recently retreated from the fighting at Elkhorn Tavern, they had regrouped, reinforced and soon proved they had some fight left in them as they mowed down the charging confederates with musket and artillery blasts. 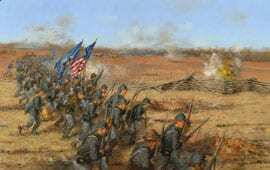 The stunned Missouri State guardsmen fell back to the opposite side of the field as darkness covered the battlefield. At this point Curtis had managed to turn his entire army around 180 degrees, the only time in American history where an entire army had accomplished such a feat. Although Curtis had served in the Mexican War, he had never personally lead troops into battle. Now he seized his chance. 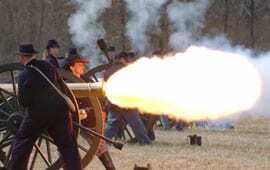 He ordered Colonel Eugene Carr to retake all the ground that was lost during the fight for Elkhorn Tavern. Curtis led these troops across Ruddick’s field and struck the confederates before they could reform. 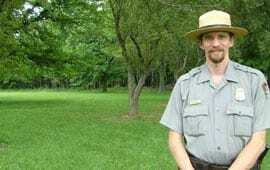 The Federals managed to push the Missouri State Guard back through the woods for several hundred yards before darkness made continuing the attack a dangerous proposition. All through the night the Army of the Southwest moved to take up positions ready for the battle to renew March 8. 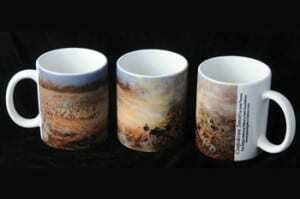 Please click the “Buy Now” Button to purchase this cup online with any major credit card.